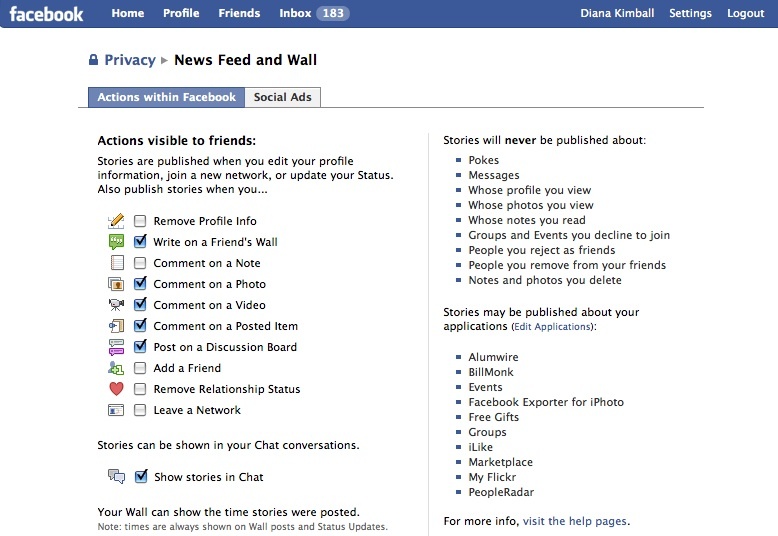 It’s true: once upon a time, Facebook‘s privacy controls could only be adjusted very coarsely. Over the past two years, though, Facebook has steadily improved its privacy controls—to the point that there’s very little that can’t be adjusted, now. These controls, though, aren’t worth much if Digital Natives don’t use them to fine-tune their online environments. Since this week’s theme is privacy, I wanted to kick things off with an exploration of Facebook’s privacy controls. On the Profile Privacy page, it’s possible to go line-by-line and fine-tune the accessibility of each piece of information. For instance, I can decide that posts on my Wall will be seen only by my friends, or that my work info will be visible only to people in the Harvard network. (The Harvard network is limited to people who have email addresses ending in -harvard.edu. I might feel comfortable sharing the details of my work history with those people, but not with out-of-state acquaintances.) I’m especially fascinated by the search box at the top of this page: “see how a friend sees your profile.” This feature handily illustrates the ways that Facebook now allows users to compose faceted identities. Next up: the Search Privacy page. It’s actually possible to circumscribe your presence on Facebook such that strangers searching for you won’t even be able to see that you’re on Facebook at all. A search for your name, if you chose to limit your search availability, would turn up nothing. 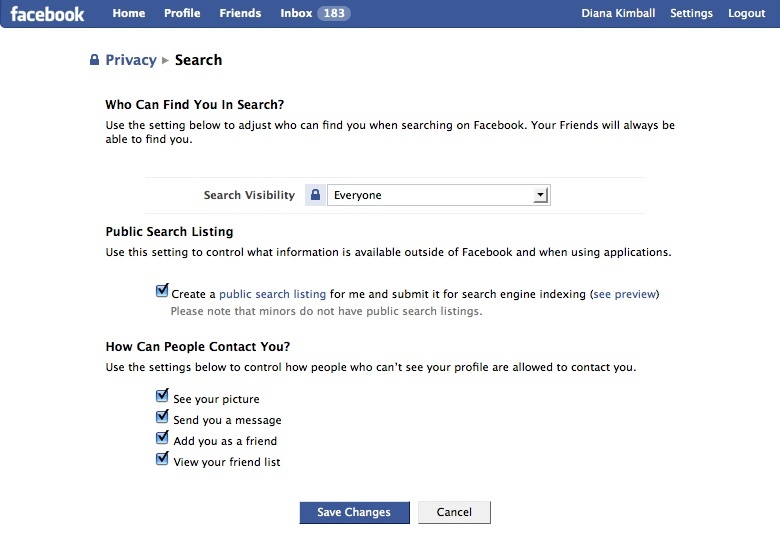 Also notable on the Search Privacy page is the option to remove your public search listing—the link to Facebook that’s indexed on search engines under an individual’s name. One of the most common concerns I hear from parents is “Will anybody be able to find my child’s Facebook page on Google?” The Search Privacy page on Facebook actually gives a definitive answer: the Facebook pages of minors are automatically not submitted to search engine indexes. If your child is a minor, then a Google search will not turn up a link to your child’s Facebook presence. And even if your child isn’t a minor, the Search Privacy page offers a way to opt out of search engine indexing for non-minors. This is a very simple and effective step to take in protecting online privacy, though it’s worth noting that the Facebook page that shows up in Google results is vastly limited; in fact, it only shows a headshot, the headshots of a few of that person’s friends, and the ability to log in to Facebook itself. This page is interesting in that it allows you control what’s reported to your friends on Facebook. If a person removes a relationship status, and has unchecked the box such that relationship removals aren’t reported, then no part of Facebook will actively tell your friends about your breakup. They’ll still be able to take a look at your profile and notice the absence of the breakup, if you’ve elected to make that information visible. But if you don’t want the breakup shouted from the rooftops, and don’t want to cause a fuss, it’s possible to just gently change the state of the profile page without it being a huge deal. The Applications Privacy page offers good information on how Facebook’s platform interacts with developers’ applications, but I’m actually more interested in what comes below the link to the Applications Page: the “Block People” field. This is Facebook’s strongest tool for dealing with unpleasant interlopers. 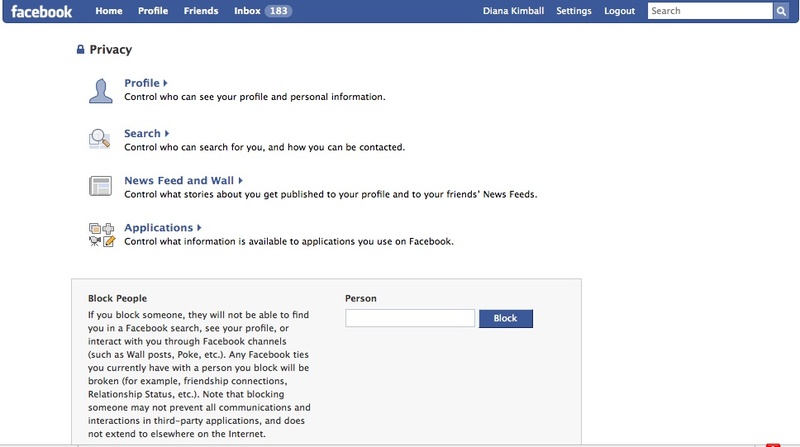 Blocking someone means that they cannot “find you in a Facebook search, see your profile, or interact with you through Facebook channels (such as Wall posts, Poke, etc. ).” Though the text of the field reminds the user that this blocking “does not extend to elsewhere on the Internet,” it remains a powerful tool for severing communications with people on Facebook, should such a need ever arise. Facebook’s privacy controls have grown more and more powerful. Having not adjusted my own privacy controls in a while, I was excited to see how far they’ve come. Facebook has long allowed Digital Natives to publish unprecedented volumes of personal information. Though this can have some great consequences—friends being able to find your phone number when they need it, the instant sharing of photographs, a way to effortlessly message contacts—it can also have some unintended ones. Facebook’s success depends on its ability to keep those who use it feeling comfortable. Their privacy controls have gone a long way towards allowing every Facebook user to determine exactly what levels of information sharing they are and aren’t comfortable with. Ultimately, privacy on the internet isn’t about keeping all personal information under wraps all of the time. It’s about making sure that the right information is available to the right people at the right times. 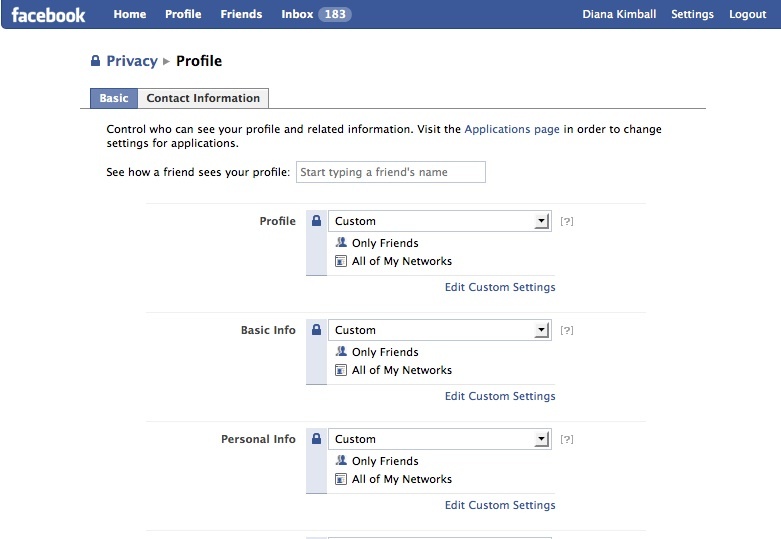 Facebook’s privacy controls go a long way toward putting this capability in the hands of Digital Natives. Many Digital Natives, sadly, never seize this opportunity because they don’t know it’s there. My hope is that this post will start more parents, teachers, and Digital Natives thinking about the ways in which they can seize control of their personal information—safeguarding their privacy in the process. There’s a whole other issue, Diana, which you didn’t mention above and that involves the applications or widgets (seen in the new Facebook layout under the “Boxes” tab). In a nutshell, every time you install a new widget, you are granting that developer the right to see and use every item in your profile. The catch is, unless you click a link, you’d never know. Don’t get me wrong, I’m perfectly happy with these controls, but I think they can be daunting for users who are not particularly familiar with Facebook. Is this an issue in itself, especially if privacy is opt-in (as it is on Facebook) rather than opt-out? The people who are least well-informed would be the most affected..
And as Ari has pointed out, “applications” privacy is another ball game to keep on top of.